This is your one-stop discount printer resource. 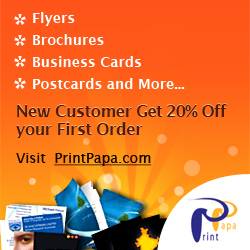 Click on any of the banners here to get real-time online prices for high quality print jobs. Many places offer same day printing and overnight shipping. These companies offer books, booklets, business cards, brochures, banners, calendars, door hangers, flyers, greeting cards, postcards, posters business forms and much more. A few offer sample packs for free and postcard mailing services. Most of these places offer prices, quality and turnaround time that is on par with or even better than many of the chain office superstores. Gone are the days when you had to order 10,000 pieces to make it cost effective to order full process color printing. Today printers are able to print short-run full color jobs at reasonable prices so you can order 250 sales flyers with full color for pennies a piece. Everybody loves free stuff, especially your customers if you are a business owner. Having your logo printed on an item and giving it away is a great way to keep your business in the mind of your customers and let them know you appreciate their business. Many more business print their logo on shirts, mugs, hats, pens, balloons, etc. and sell them. You can also get creative and imprint calculators, band-aid dispensers, USB thumb drives, laptop bags, flashlights, and the list goes on and on. One of the best places to get your personalized gear is CafePress.com. Get Personal for any Holiday Season at CafePress.com! You can also click the CafePress.com below to support Autism Speaks. For those of you looking for great stock photo to be used in your web sites, graphics and prints check out the sites linked here. Dreamstime offers a free stock photo section (which I use often) as well as great stock photos available at discounted prices. 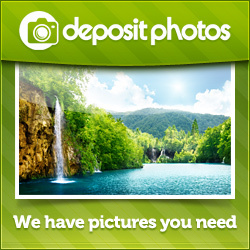 Deposit Photos is another well known stock photo site with a great selection.